Now this I disapprove of. The Washington Post’s brilliant Dan Steinberg posted this video from the Nats/Phillies game on Monday showing visiting Phillies fans taunting former Phillie Jayson Werth during the Phillies win. We told you yesterday about how Phillies fans have completely taken over Nationals Park and made it a second home stadium for Roy Halladay and company. But it’s bad juju to take advantage of that annexation to mercilessly heckle a dude who left the team for more money (as anyone would) without any unkind words for his former teammates or the hometown fans. Come on now, Phillies denizens. You know better than this. No wonder the Nats turned it around and spanked the Phillies the next day. That’s just karma getting in its licks. This video represents a bizarre dynamic. Here we have a former beloved Phillie leaving for another town, only to have his old fans take over that town and spend the whole game taunting him for leaving. Seems kinda cruel, or as cruel as one can be to a guy making $18 million a year. I know it’s easy to get a bunker mentality as a fan and just go ahead and boo anyone who leaves your team for any reason, but Jayson Werth doesn’t deserve that. He’s already struggling on a crummy team and that’s revenge enough. 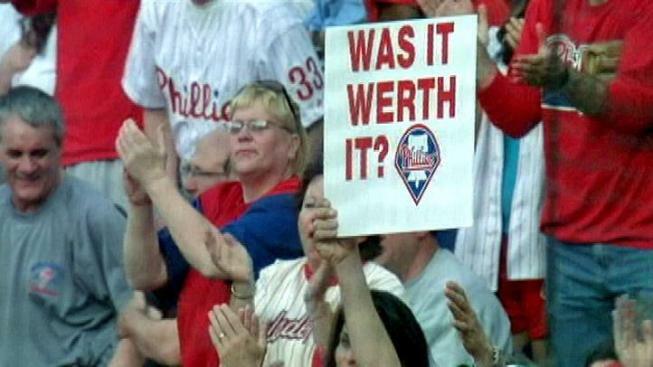 Besides, the Phillies have still yet to find a way to adequately replace him, so it’s hard to taunt Werth without acknowledging that Philly sure could use him back in the lineup. So the next time you decide to take over Nationals Park, Phillies fans, leave poor rich Jayson Werth alone with his beard and his thoughts. You’ll be better men for it.